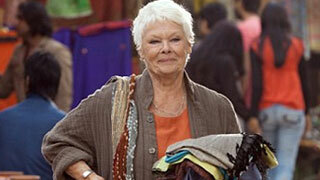 Judi Dench as seen in the film. This week one of our favorite Afternoon Tea actresses returns to the big screen, when The Second Best Exotic Marigold Hotel opens up here in the U.S.
Dame Judi Dench stars in the film, alongside a host of other familiar faces, including Downton Abbey’s Penelope Wilton and Dame Maggie Smith, Worricker’s Bill Nighy, and After You’ve Gone’s Celia Imrie. The ability to make a good cup of tea is of prime importance to Nighy, who is a self-confessed addict to Yorkshire tea. “Nothing else can really hit the spot”, says Nighy. Tea, therefore, was one of the things the actor made sure to pack when travelling to India. The other thing was a huge jar of Marmite, which turned out to be too large to get through security so Nighy ended up collecting 30 tiny allowable size jars from all the cafes in the terminal, into which he dispensed the contents of his one large jar. 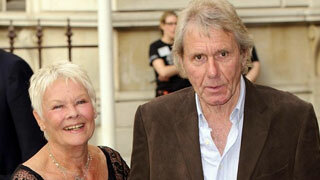 The cast of The Second Best Exotic Marigold Hotel. 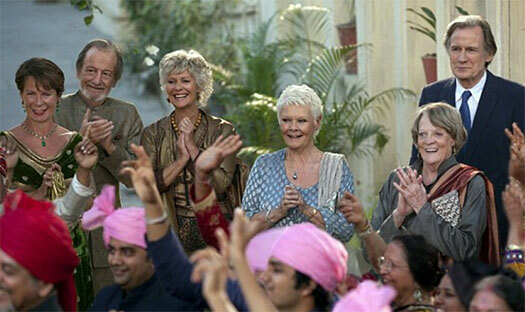 If you get a chance to see The Second Best Exotic Marigold Hotel, drop me a line and let me know how you like it. 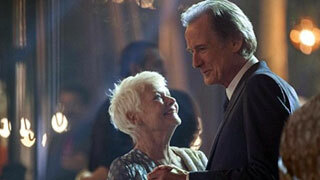 And don’t forget to see Dame Judi Dench weekday afternoons at 3pm, in As Time Goes By on Afternoon Tea.